Breath taking panorama with the divine presence of Buddha .The giant Tian Tan Buddha statue was covered with mist. Lantau Island in Hong Kong is a must visit place for a serene and spiritual experience. This majestic statue symbolizes the stability of Hong Kong, prosperity of China and peace on earth. 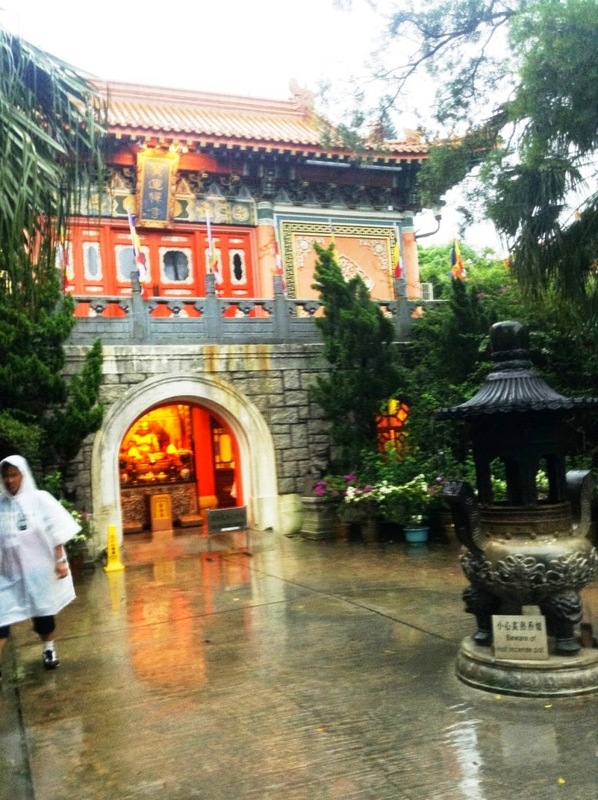 Below the Big Buddha statue , there is Po Lin monastery main temple. Vegetarian food is available near the temple. But if you are not a big fan of traditional Cantonese delicacies, it is better to avoid eating out here. Visiting the temple was an intriguing experience . The main temple houses three bronze statues of the Buddha – representing his past, present and future lives – as well as many Buddhist scriptures. Nature was at it's best with heavy showers .What more can one ask for? The place displayed a unique tranquility as the majestic Buddha statue slowly got covered by thick mist . It was one of my life's memorable moments. At the MTR station ,Hong Kong. Your write ups are so useful and informative...We love your variety of topics...Keep writing ! !